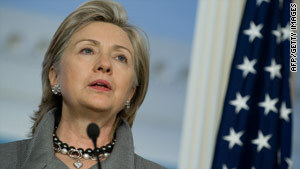 Secretary of State Hillary Clinton harshly rebuked Iran and Syria in an appearance Thursday night. Clinton: Iran "continues to threaten Israel, destabilize the region and sponsor terror"
(CNN) -- As the United States prepares for a visit next week by Iranian President Mahmoud Ahmadinejad, Secretary of State Hillary Clinton condemned his regime in some of the Obama administration's strongest language to date in a speech Thursday night. "Iran, with its anti-Semitic president and hostile nuclear ambitions, also continues to threaten Israel, destabilize the region, and sponsor terror," Clinton said, addressing the annual meeting of the American Jewish Committee. "The United States is committed to pursuing [a] diplomatic path. But we will not compromise our commitment to preventing Iran from developing nuclear weapons." Ahmadinejad is expected to be in New York for a United Nations conference on nuclear nonproliferation that opens Monday. The United States has said it will likely grant the Iranian leader's request for a visa. Clinton also took on Syria on Thursday night, speaking of "grave dangers of Syria's transfer of weapons to [Hezbollah]," and warning that such a move by Syrian President Bashar al-Assad would "have a profoundly destabilizing effect on the region" and would violate a U.N. Security Council resolution. U.S. officials this month accused Syria of trying to supply weapons to Hezbollah, a Lebanese political party that the United States has labeled a terrorist organization. "We do not accept such provocative and destabilizing behavior -- and nor should the international community," Clinton said. "President Assad is making decisions that could mean war or peace for the region." "There should be no mistake, either in Damascus or anywhere else: The United States is not re-engaging with Syria as a reward or a concession," Clinton said, referring to the Obama administration's plan to appoint an ambassador to Syria. "Engagement is a tool that can give us added leverage and insight and a greater ability to convey strong and clear messages aimed at changing Syria's behavior." More than a thousand people, including members of Congress and diplomats, were packed into a ballroom at a downtown Washington hotel for the event. Clinton received a warm reception, with her speech repeatedly interrupted by applause. Israeli Defense Minister Ehud Barak, who followed Clinton at the event, remarked on recent tensions between the Obama administration and the Jewish state, which have revolved largely around President Obama's call for the Israelis to freeze settlements in the Palestinian territories. "I feel very strongly that these differences, these slight disputes, are behind us," Barak said Thursday. Barak called 2010 a year of "exceptional threats and opportunities" for Israel and spoke of "heavy clouds looming over the horizon" in reference to Hezbollah, Hamas and Iran. He said nations opposed to Iran moving forward with the development of nuclear weapons should support sanctions against it. "For the time-being, it is time for sanctions," Barak said. "They should be effective." But he said that sanctions required clear time limits. CNN's Charley Keyes contributed to this report.